For tagging yourself with 5 tags. Beat the Snowman to progress. Talk and discuss anything football related. Any team. Any League. Any Tournament. Transfer news. Players. 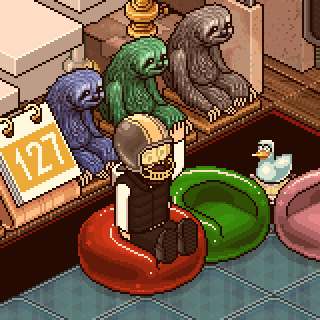 This is Habbo's #1 football forum. Chat, chill out and discuss whatever you like, I suggest football. Feel free to place stickies in here to boost your achievement for placing stickies. Eurx has entered the building! Taken in this room on 12 October 2016 and received 1 likes. Taken in this room on 21 August 2016 and received 0 likes. Taken in this room on 18 August 2016 and received 1 likes. Taken in this room on 18 August 2016 and received 0 likes. Taken in this room on 17 August 2016 and received 0 likes. Taken in this room on 15 August 2016 and received 0 likes. Taken in this room on 13 August 2016 and received 1 likes. Taken in this room on 13 August 2016 and received 0 likes. Taken in this room on 7 August 2016 and received 0 likes. Taken in this room on 31 July 2016 and received 0 likes. Taken in this room on 30 July 2016 and received 0 likes. Taken in this room on 29 July 2016 and received 1 likes. Taken in this room on 29 July 2016 and received 0 likes. Taken in this room on 25 July 2016 and received 0 likes. Taken in this room on 29 May 2016 and received 1 likes. Taken in this room on 29 May 2016 and received 0 likes. Taken in this room on 21 May 2016 and received 1 likes. Taken in this room on 21 May 2016 and received 0 likes. Taken in this room on 16 May 2016 and received 0 likes.